As humans continued to settle, they formed more organized civilizations with religions, systems of writing, architectural traditions, and class systems. This module will discuss the rise of civilization from the Mesopotamian cultures through the three thousand years of ancient Egypt. Have a contextual understanding of the early civilizations in Mesopotamia and Egypt. Have a formal understanding of various styles, media, and methods of artistic and architectural production. Understanding various art historical themes that are present within these cultures. Ancient Mesopotamia, also known as the "fertile crescent," was an area of the now Middle East where the rivers Tigris and Euphrates fed the birth of several civilizations over the span of four thousand years between 3500 BCE and 636 CE. Cultures such as the Summerian, Akkadian, Neo-Sumerian, Babylonian, Hittite, Assyrian, Neo Babylonian, Achaeminid, Greco-Roman, and Sassanian cultures all held power at various points. Great cities such as ancient Babylon, Ur, Uruk, and others demonstrated the power of such cultures to organize and develop their surroundings. The civilizations invented the wheel, writing, and law. They had a variety of religions with the main purposes of praying and sacrificing for regular floods and harvests, even that was not often the reality between these rivers. Their cuneiform system of writing allowed them to document their history and record offerings, while laws, such as the "Code of Hammurabi," have become precedents to modern law, including the concept of presumed innocence. To help form a better understanding of the context of these cultures, I have compiled a few resources. I do not expect you to read or watch all of them, (because there are a lot of resources), but please pay attention to the contextual history of the area and form a general understanding before moving forward. British Museum's Resources for Mesopotamia: Useful overview of the context of the Mesopotamian cultures. Fordham University Internet Ancient History Sourcebook: A list of links to other online resources (note: Many links on this list are dead or not up to date). Ancient Egypt is an empire that lasted over three thousand years from nearly 3500 BCE to 30 CE or 3000 BCE to 332 BCE depending on which markers you use. The very length of this civilization's survival continues to awe, espeically as we compare the United State's 240-year history. Egyptian history has been broken up by Egyptologists to three main periods defined by dynasties: Old Kingdom from 2649 to 2152 BCE; Middle Kingdom from 2040 to 1640 BCE; New Kingdom from 1550 to 1070 BCE. Between and after these are a few "intermediate periods," which came about from times of turmoil or transition, including the Armana Period under Pharaoh Akhenaton. 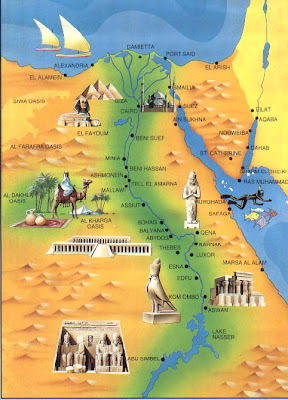 The Egyptian civilization grew up along the Nile river and is divided into Lower Egypt (North) and Upper Egypt (South) according to the flow of this river. The river was tame and had fertile banks that were easy to cultivate, which allowed the civilization as a whole to become extremely wealthy. The civilization was not bound to the river, though, as it crept into the Sahara Desert. The civilization's structure included a religion with a polytheistic mythology focusing on the concept of an afterlife and the soul or "Ka." The civilization was ruled by a king called Pharaoh, who was essentially a god on Earth. Life centered on preparing for death and the afterlife. Ancient Egypt Greatest Pharaohs 3150 to 1351 BCE and 1350 to 30 BCE: Two documentaries on the various Pharaohs from the History Channel. Both are 45 minutes long. College of Charleston's Introduction to Ancient Egypt: Course page for a course on ancient Egypt. Lists of terms, visuals and chronology found here along with professor's essays and further reading. These early civilizations saw innovations in architecture as the settlements allowed people to plan and build grand structures to weather the elements and honor gods and/or kings. Innovations in building techniques and materials led to the development of truly staggering structures. Mesopotamian cultures were known for their ziggurats, walled structures and citadels, and grand columned and vaulted halls. The Egyptians developed wonders of the ancient world including pyramids, necropolises, rock-cut tombs, massive temple structures, hypo-style halls, and large obelisks. In this section, we will focus on these architectural innovations. Persepolis: Google Map/Earth view of the archaeological site. Alexander the Great Burning of Persepolis: Ancient History Encyclopaedia article by Joshua J. Mark (2011). Persepolis: The Audience Hall of Darius and Xerxes: Khan Academy Article. Reconstruction of the Persepolis Palace: An animated reconstruction of the Persepolis site. The Giza Plateau: This is a Harvard project that provides virtual tours and compiles a ton of resources on the topic of the Great Pyramids. The rise of these cultures required a system for documenting trade, religious beliefs and practices, and history. The Summerians invented a system of wedge-like marks pressed into wet clay as a surface called cuneiform. Egyptians also had a system of writing called hieroglyphics. Both systems were pictographic languages, where a symbol represented a noun or verb. Proper names or other phonic words were often created by combining images to be sounded out. For many years Egyptian hieroglyphs were unreadable, until the discovery of the Rosetta stone, a legal document that was written in formal heiroglyphs, vernacular hieroglyphs, and ancient Greek. The Greek was used to translate many of the heiroglyphs. Sculpted object from these ancient civilizations have lasted the years and now act as windows into these periods. Many types of materials have been found, and these give us insights into what each culture valued. Sculptures were constructed out of marble, limestone, copper, diorite, basalt, and bronze. The sculptures document historic events, people, gods, and real as well as mythical beasts demonstrating the power of the empires. https://www.dailymotion.com/video/x2pztmx PBS documentary on Ancient depictions of human imagery and its symbolism. Very little remains of paintings from these time periods. Some paintings survived on the walls within tombs and on parchment. Earlier cultures have two dimensional images that have survived made from lapis and mosaic. Below are a few examples. Pay attention to the concepts of the canon of proportions and composite view versus the naturalism of other elements. When reviewing the artworks of these various cultures, there are many themes that can be discussed including technology, narrative, and images of animals to name a few. I intend to focus instead on two broader themes that will carry on through other cultures as well: religion and power. The rise of culture demonstrated these two themes as necessary to maintain social structures for hundreds and thousands of years. Artists adapted and demonstrated these themes throughout the artworks that have survived.